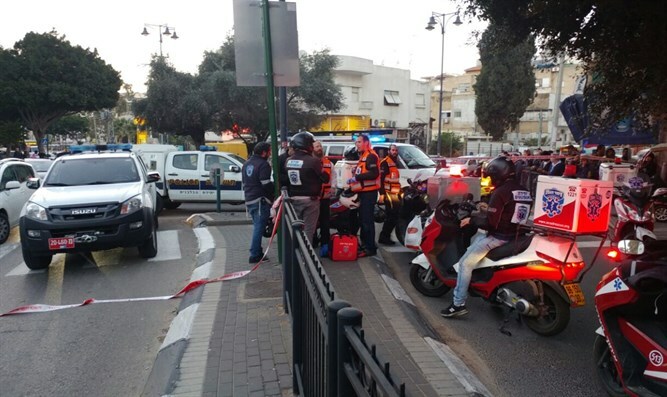 Terrorist in custody after six wounded in shooting, stabbing attack in Petah Tikva market. Six people were wounded in a combination shooting and stabbing attack Thursday afternoon in a Petah Tikva market. At 4:42, MDA first responders were dispatched to the market after the MDA Yarkon Region call center received a report regarding the attack. MDA Emergency responders report that two men and two women were wounded in the attack, including a man and woman in their 50s, a man in his 40s, and a woman in her 30s. Most of the victims were shot by the terrorist, while at least one was stabbed. The ages of the two additional victims have yet to be released. The injuries of all six are said to be light or light-to-moderate. Police units have been deployed to the area, and are investigating the shooting. Police say the terrorist, a 19-year old man from the Palestinian Authority city of Shechem in Samaria, was subdued by civilians at the scene while still carrying his gun. He was then handed over to authorities. A senior EMT who responded to the attack said the market was in “chaos” following the shootings. "There was a riot and chaos when I arrived on the scene. I identified a 30-year old female sitting on a chair at the entrance of a store. She suffered wounds to her limbs but was fully conscious. Ten meters away, there were a male and a female in their 50s, also fully conscious, with wounds to their lower extremities. We provided them with preliminary medical treatment and quickly evacuated them to the hospital in light-moderate condition."